Considerable damage and expense was incurred, and two highway construction workers were injured, during a complex tandem lift involving two cranes. A 90-foot lattice boom collapsed when the work radius and weight capacity of a crane to lift a 40-foot concrete beam was miscalculated. The cause of the incident was a failure to stay within the crane’s safe operating limits. One side of the beam had already been raised when the second crane’s operator was instructed to raise his end of the concrete beam. Movement of the load caused the back end of the first crane carrier to rise about 3.6 m in the air. The beam was quickly lowered to the ground causing the lattice boom to strike the capbeam. This resulted in the crane carrier dropping back on its wheels, thereby creating a spring action in the boom. The boom fell backwards, hit the crane cab and collapsed onto a nearby truck. Five workers in the immediate vicinity could have suffered severe injuries or death. An investigation concluded that proper planning and procedure was not in place at the time of the incident. Lifts involving two or more cranes are complex operations requiring considerable skill and planning. As a result, multiple crane lifts (or tandem lifts) must be planned and carried out under a competent person’s supervision. Boom angle indicators are required on all mobile cranes, but they must not be relied upon for accuracy in critical lifts such as tandem lifts. A load moment indicator (LMI) gives an accurate angle as well as loading throughout the lift. According to paragraph 207(2)(e) of Regulation 91-191 under the Occupational Health and Safety Act, an employer must ensure mobile cranes are operated as per CSA standard Z150-98, “Safety Code for Mobile Cranes”. 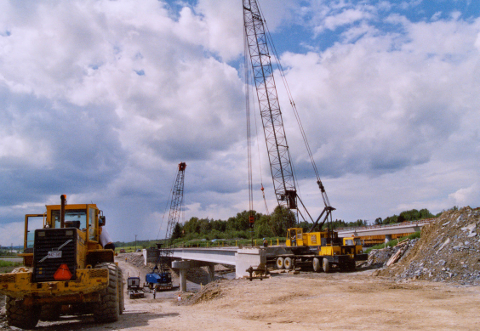 The standard contains many provisions such as those outlined above that must be followed when operating a crane in the province of New Brunswick. To obtain a copy of the standard, contact the Canadian Standards Association. The Construction Safety Association of Ontario’s Mobile Crane Manual is also a great resource that contains a significant amount of information (including information on multiple crane lifts) on the safe operation of cranes. To obtain a copy, contact the New Brunswick Construction Safety Association.